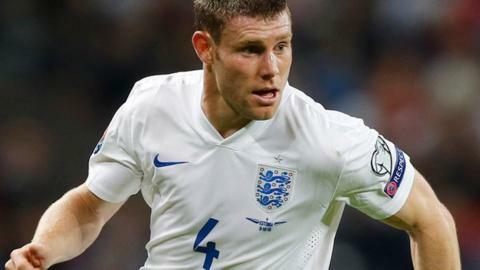 Midfielder James Milner will miss England's friendlies against Spain and France after failing to shake off a hamstring injury. Head coach Roy Hodgson will not call up a replacement for the 29-year-old, who also missed Liverpool's defeat by Crystal Palace on Sunday. His absence increases Tottenham pair Dele Alli and Eric Dier's chances of making a first international start. England play Spain in Alicante on Friday and France at Wembley next week. Injury has already deprived Hodgson of Everton defender Phil Jagielka, Arsenal pair Theo Walcott and Alex Oxlade-Chamberlain and Liverpool forward Danny Ings. Hodgson's side secured their place at Euro 2016 with 10 wins from 10 matches.